Figure 6. 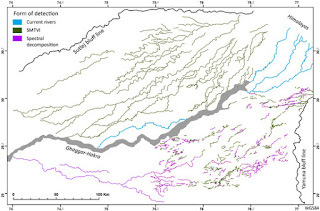 Results of the interpretation of both SMTVI and seasonal multi-temporal spectral decomposition techniques for the reconstruction of the palaeo-hydrological network of the Sutlej-Yamuna interfluve. Abstract: Remote sensing has considerable potential to contribute to the identification and reconstruction of lost hydrological systems and networks. Remote sensing-based reconstructions of palaeo-river networks have commonly employed single or limited time-span imagery, which limits their capacity to identify features in complex and varied landscape contexts. This paper presents a seasonal multi-temporal approach to the detection of palaeo-rivers over large areas based on long-term vegetation dynamics and spectral decomposition techniques. Twenty-eight years of Landsat 5 data, a total of 1711 multi-spectral images, have been bulk processed using Google Earth Engine© Code Editor and cloud computing infrastructure. The use of multi-temporal data has allowed us to overcome seasonal cultivation patterns and long-term visibility issues related to recent crop selection, extensive irrigation and land-use patterns. 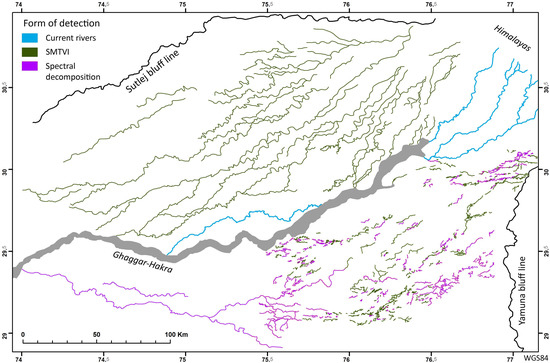 The application of this approach on the Sutlej-Yamuna interfluve (northwest India), a core area for the Bronze Age Indus Civilisation, has enabled the reconstruction of an unsuspectedly complex palaeo-river network comprising more than 8000 km of palaeo-channels. It has also enabled the definition of the morphology of these relict courses, which provides insights into the environmental conditions in which they operated. These new data will contribute to a better understanding of the settlement distribution and environmental settings in which this, often considered riverine, civilisation operated. Several relevant results for the reconstruction of the hydrologic history of the northern sector of the study area have been obtained through the use of seasonal vegetation mapping: (1) the confirmation of a major palaeo-course of the later Sutlej river, which contributed to the Ghaggar-Hakra system, though when and for how long remains unknown (top right corner of the lower image in Figure 3); (2) the migration of this same major watercourse from the Ghaggar-Hakra catchment to that of the Sutlej, which would have significantly reduced the amount of water available in the Ghaggar-Hakra’s lower course; and, perhaps most significantly, (3) the multiplication of the palaeo-rivers known in the area, which indicates that as a whole, the region has an extremely complex fluvial history, which will have had important and as yet poorly resolved consequences for water availability and thus also for past human habitation and land-use. SMTVI also allowed study of the morphology of the palaeo-rivers and documentation of multiple avulsion episodes, with consequences for the human habitation and use of the area through which these flowed. Our results prove that the factors influencing water availability along the Ghaggar-Hakra basin are much more complex than previously thought. The traces of palaeo-rivers that have been identified cover the entirety of the landscape in the northern sector forming an almost continuous parallel pattern, which points to the changing nature of these channels and the likelihood that floods and river avulsions have been a relative common occurrence. The waters feeding the various palaeo-rivers originated from glacier-fed sources, such as water supplying the various palaeo-rivers related to the Sutlej, which appear to include the main Ghaggar-Hakra channel, as well as monsoonal rain which is likely to have contributed to both perennial and ephemeral rivers (see [10,27,65]). The geographic source of watercourses ranges from the Himalayas to the Aravalli mountains, and seasonal rain patterns and discharge across this zone are very different. All these factors join to create an extremely complex picture in which water availability and location is dependent upon a multiplicity of factors and difficult to predict in the long term.